my soul and upon it I shall rest. Welcome - We all have unique four legged stools, each leg an extension from our grandparents who contribute to our being. At conception, our entire biology stems from our forebears, the history that preceded us. Our environment, first from within the womb then from without, people and events, often beyond our control, shape us further. If history does repeat, did our forebears experience what we now are experiencing? And if so, will we react as they once did? And if our biological bonds forget, will random energy pulses trigger a memory cord? On this site are several register formatted, diligently footnoted papers on my or my wife Jill's four legged stools. My paternal grandparents' surnames are WOOLLACOTT and WILLIAMS and my maternal ones are NAULT and YOUNG; Jill's are CHANDLER and HART, GERMOND and CHAMBERLAIN, respectively.While I lack any drop of blood in my veins from those last four surnames, our children do and those four form two of their legs. So yes, in a general sense, we are both 3/4 English and 1/4 French, with our French coming from our mothers' fathers. 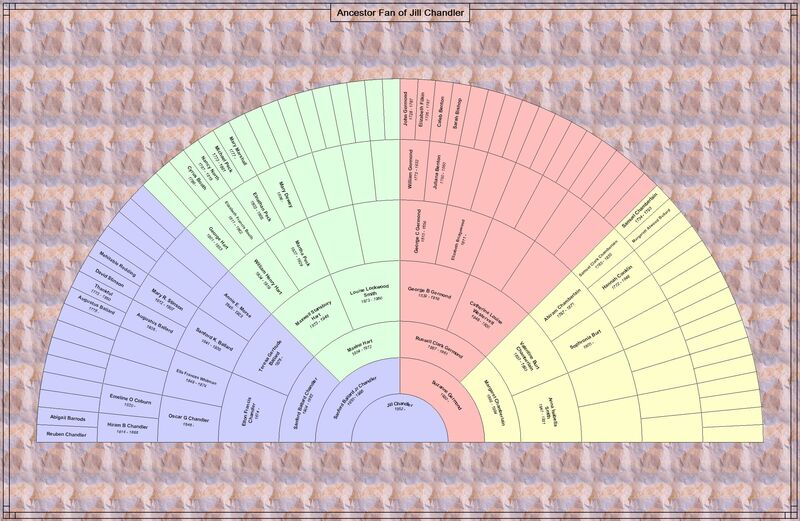 Links to our seven generation fan charts are below to give you other surnames in our genealogy. The charts, like the genealogical journey they reflect, have holes and are always being refined. Some ancestors, who preceded the seven generations shown, are known, but not presented. Others, who are shown, lack basic information, reflecting the varying comfort levels of my research thus far. 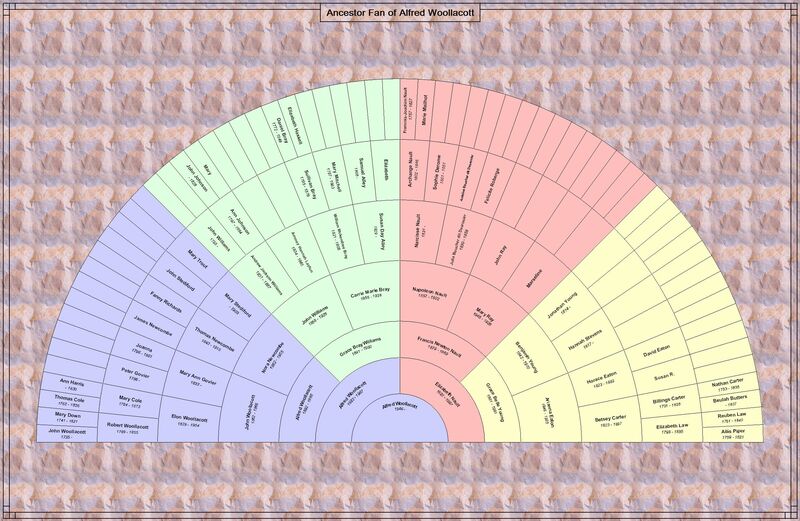 If their published genealogy is under the sections "Alfred's Four Legged Stool" or "Jill's Four Legged Stool", then my comfort is extremely high. But for others, further research may be needed before I reach a near certainty. Thus, I am loathe to publish my over 4,500 names on my Legacy file since I could perpetuate misinformation. So if some surnames pique an interest, send me an e-mail, and we can discuss them further. Some of my grandchildren are members of the Wampanoag tribe of Aquinnah, Gay Head. Their lineage, also on my Legacy file, contain surnames of BAIRD, COOK, MADISON and VANDERHOOP, among others. So if your interest is with the tribe, I can tell you what I have. But perhaps better, I can direct you to people who are more knowledgeable than I on tribal ancestry. Much of my working life was spent gathering facts to support assertions, useful for my new found passion of genealogical research. But data transcription can grow tedious, while snippets of an ancestor’s life grow fascinating, and relating them to an era, simply captivating. So with some imagination, anchored in fact and tempered with plausibility, ancestors can achieve more robust lives as envisioned by a writer with a few drops of their blood in his veins. All our ancestors lived when momentous events occurred. Some experienced them up close and personal. Ever wonder what they might have been thinking? Under the "Timelines" section are my thoughts as seen through my ancestors' eyes. Three situations intrigued me and drove me to create historical narratives. My first, "The Immigrant", is about my seven-greats grandfather John Law. "The Immigrant" tab is devoted exclusively to my debut novel, including a 45 minute interview on my journey to it. John Law's register formatted, diligently footnoted genealogy is under the section "Alfred's Four Legged Stool". So if like Joe Friday you desire "just the facts, ma'am, just the facts", then read John Law of Acton, Massachusetts, Reuben Law of Acton, Massachusetts and Sharon, New Hampshire, which was published in 2011. But if you ever wondered about the Battle of Dunbar, the horrors of Durham Cathedral that ensued, or life as a Scottish immigrant in a Puritan theocracy, then read my book. -------------------------------------------------------------------------------------------------------------------------------Reuben Law, John's great grandson, was at "The Bridge" with the Acton Militia on 19 April 1775 and at Bunker Hill two months later. "Other Timelines" contains a snippet of his thoughts on April 19th. Reuben's three generations are under "Alfred's Four Legged Stool" embedded as an upload -- Reuben Law of Acton, Massachusetts and Sharon, New Hampshire. Reuben appears in the first chapters of "The Immigrant" and "The Believers In The Crucible Nauvoo".and will be the protagonist in last of the trilogy, "The Patriot", which is in process. Reuben's daughter Susanna, her husband, two of their children, and Naamah, Reuben's granddaughter, like many from the Peterborough, New Hampshire in the 1840s, were inspired by Joseph Smith teachings and traveled to Nauvoo, Illinois. "The Believers", a meticulously researched novel, weaves the momentous events of Joseph Smith’s martyrdom and Brigham Young’s succession with Naamah’s story and offers differing perspectives to create a mosaic of Nauvoo, the crucible out of which arose today’s Church of Jesus Christ of the Latter-day Saints. "The Believers" tabs has more.